It was the time of year we had all been waiting for – the annual menu tasting… Each year we sample some of the dishes that we offer our clients so that when it comes to the planning of an event, whether it’s a family celebration, a wedding or a conference, we are able to give first hand advice on what food and wine combinations may work best. Each March the new menu is released and it is great to see all of our hard work come together. Our team works closely with the head chefs at Prestige Venues and Events to create innovative and inspiring dishes. Our wine supplier, Bibendum, offer a fantastic selection of the finest wines and you, our guests can enjoy it! The major culinary emphasis this year was similar to last year – the best ingredients from the best local suppliers. Having recently attained our Visit Scotland Silver ‘Green Tourism’ award we are proud to take ‘sustainability’ very seriously and are delighted that we can source such high quality ingredients while also reducing our carbon footprint. During the tasting Trevor, our Head Chef, prepared and served the dishes while talking us through them. As we dined, Douglas Williamson from Bibendum guided us through our wine list and we sampled food and wine matches and clashes as it is equally important for us to know which wines don’t go with specific foods. We were privileged enough to be the first in Scotland to taste the Bibendum new releases and to hear the complete process from the vineyard to the table. And now I hand you over to the team at Dundas Castle who will share their thoughts on some of the food that we sampled. Should you fancy recreating some of the dishes below, we have also matched the perfect wine for you. This slow cooked, succulent hot canapé is perfect for any drinks reception. The wonderful beef flavours simply melt in the mouth with the subtle warmth from the horseradish moving into the fresh flavours of the flat parsley, coriander and garlic. It would be best to be positioned near to the kitchen when these come out as they are also a feast for the eyes and will not be around for long! As a pescatarian I’m normally underwhelmed with canapés at drinks receptions but this changed my mind!! It was so different and would be perfect for every season. As well as looking great, it was light, refreshing with just a hint of sweetness. I’d spend the reception following this waiter around with a glass of champagne in the other hand. Trevor described this as a leg of pork which was slow cooked for 6 hours and then picked down. After this, spices and shallots were added before it was pressed. I loved this dish; the colours and then the taste – wow! On the side of the plate were crushed peas which added fabulous colour to the dish and an amazing taste of freshness. This dish will be a winner for any function and will be perfect for any season as it is not a dish you would expect to be offered at a function, but will be impressed that you were! Elegantly presented with the different elements coming together beautifully on the plate. The duck leg is slow cooked for 3 ½ hours then stripped, compressed with confit shallots and wrapped in pancetta. This dish is rich, but that’s the way I like it, and the taste of the fresh lemon in the brioche works perfectly to balance the palette. Garnished with tahoon cress and truffle oil, this dish is a real treat! Enjoy with a glass of the Tilia Malbec, the grape of the moment! I would typically steer away from a Parfait on a menu as I always thought it was not very imaginative! However, I was very pleasantly surprised by the velvet textured dish that we were presented with. The parfait itself was wrapped in pancetta which added a dimension to the smooth and buttery texture. Complemented with a caramelised fig and port & rosemary puree the dish was served with highland cress, lettuce and slices of warm brioche. This dish would ideally be served before a lamb or beef dish and would be welcomed by some of our shooting clients on a winter/autumn menu. This is a beautifully presented dish that doesn’t disappoint. It’s so colourful and tastes divine. The flavours are quite delicate and complement each other perfectly, but the lemon really makes it sing with the subtle aftertaste of the champagne coming through to round things off. It would be perfect with a glass of the Riff Pinot Grigio delle Venezie Terra Alpina 2011. A first for my pallet and now a dish I will no longer avoid when seen on a menu. This game dish was pleasantly mild and hearty and one I would recommend for a summer’s lunch. 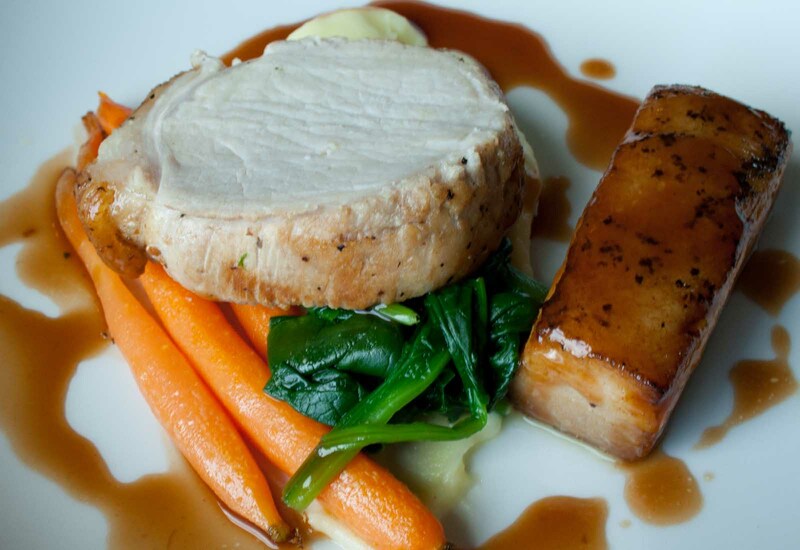 The guinea fowl breast had been poached and returned to the plate with the bone. It was served with Girolles and seasonal mini vegetables including a braised gem lettuce leaf. The red wine jus completed this amazingly succulant dish. This was one that we were all anticipating. Chicken is a popular choice for events as it is a bit of a ‘catch all’ for guest dietary preferences. And boy, were we a happy team when we saw this creation! It truly takes the classic chicken dish up a level. Aesthetically it looks exciting with the splash of the red pepper making a real statement. The taste is best described as ‘pleasingly unexpected’. The potatoes have been smoked over hickory wood chips and the sweetness of the pepper gives the chicken a really interesting taste. I would be delighted to be served this at an event and would consider if it was appropriate to ask for seconds! Enjoy this with a deep white or even an Acacia Tree Pinotage 2012! When you first see the succulent, pink lamb nestled on top of the Puy lentils and cabbage you can’t help but start to salivate. The lamb cuts easily and the flavours come powering through. Follow this with the boudin noir, deep black in colour and with wonderful rich mineral flavours that complement the lamb to perfection. Couple this with the taste and texture of the Puy lentils and cabbage and this dish is a real crowd pleaser. The crispy rosti, miniature onions and the onion jus finish off the dish perfectly. Everything on the plate complements each other and there are endless combinations to try. If this dish was at a local restaurant I would become a regular! To accompany the lamb I would recommend the Bush Telegraph Shiraz Viognier from Australia. The classic peppery flavours of the shiraz really complement the meat and it stands up well to the mineral flavours of the boudin noir. The full bodied after taste of the Viognier works well with the lamb and gives this wine a rounded and full flavoured finish. What strikes you first when the plate is put in front of you are the vibrant colours of this dish. Set on a potato and smoked haddock brandade, the vivid pink of the Inverawe sea trout stands out fantastically against the rich yellow of the warm champagne and soft herb butter finished with lemon juice that gives it the lovely citrusy taste. The bright green of the samphire and earthy tones of the Girolle mushrooms complete the picture and balance this beautiful dish perfectly. To complement this colourful dish I would suggest the Macon Villages Cave de Lugny 2011 from the south of the Burgundy region in France. The buttery finish of this clean and crisp wine made from 100% Chardonnay grapes rounds off this main course effortlessly. This is my cup of tea – a dessert that’s sweet but not obviously so due to the cardamom flavouring. The cardamom wasn’t as overpowering as I expected it to be but just brought it all together. Cake and pannacotta topped with cardamom sugar…two desserts for the price of one! A glass of dessert wine to accompany it, don’t mind if I do, the delicate fruit flavours in the Royal Tokaji Late Harvest wine enhance the flavours in the dessert. Mind you I could have equally enjoyed a cup of tea or coffee with it…or as well as. As you can see, we had a lot of fun at the menu tasting and we’d be delighted to share our thoughts with you when planning your event. A huge thank you to our dedicated caterers, Prestige Venues and Events, who always manage to create enviable menus that ensure that the Dundas dining experience is unrivalled and never forgotten.